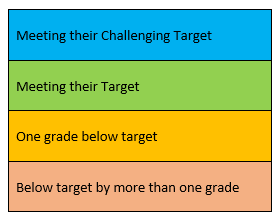 Students are given a challenging end of year target grade for every subject (these grades can vary subject to subject). They are a number grade between 9-1. The letter ‘a’ after the grade number indicates that the student has a target at the top of that grade number, the letter ‘b’ after the number indicates a target in mid range of that grade number and the letter ‘c’ after the grade indicates a target grade number in the lower half of that grade. Tests/Assessments are carried out by subject areas on an on going basis. At three designated assessment points throughout the year, subject areas set a formal assessment that takes prior and current learning into account. These are graded with a GCSE number 9-1.